The huge rocket NASA is developing to get astronauts to an asteroid, Mars and other distant destinations should also greatly aid robotic exploration efforts, members of Congress were told Tuesday (July 28). The Space Launch System (SLS) megarocket, scheduled to fly for the first time in 2018, will blast unmanned spacecraft toward their targets at incredible speeds, dramatically reducing interplanetary travel times, said John Grunsfeld, associate administrator of NASA's Science Mission Directorate. "This is one of those rare cases where time really is money," he said. "In that extra cruise time, you know, we have to maintain an engineering team and a science team and a spacecraft while it's in cruise, even if we hibernate. And that's something that also delays the science." NASA's New Horizons spacecraft, which just two weeks ago performed history's first-ever flyby of Pluto, was launched by a United Launch Alliance Atlas V rocket. New Horizons weighed just 1,050 lbs. (480 kilograms) fully fueled, but its mission still required the most powerful variant of the Atlas V, Grunsfeld said. And New Horizons zoomed straight through the Pluto system at high speed for a one-time flyby. Spacecraft that linger around a celestial body — such as the Europa probe, which will perform at least 45 flybys of Europa from Jupiter orbit — cannot travel so light, said New Horizons principal investigator Alan Stern, of the Southwest Research Institute in Boulder, Colorado. For orbiters and surface craft, "you need to carry a lot of fuel, and there's no way to lighten the fuel; you need it so you can come to a stop on that planetary surface or in orbit," Stern told committee members during today's hearing. "SLS is going to really help us enable [such] space missions, including — I hope one day — a return to the Pluto system and the Kuiper Belt." SLS could also aid deep-space astronomy, by allowing larger and more powerful space telescopes to be launched, Grunsfeld said. The rocket could launch entire space observatories, or perhaps "parts that astronauts could assemble to build a telescope that could search for atmospheres around nearby [alien] worlds," Grunsfeld said. In its initial configuration, SLS will stand 321 feet (98 meters) tall and be capable of lofting 77 tons (70,000 kg) to low-Earth orbit. The rocket will provide about 10 percent more thrust than NASA's famous Saturn V rocket, which blasted astronauts toward the moon, agency officials say. 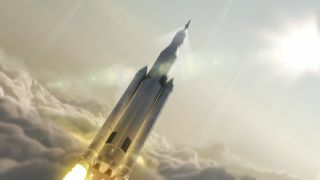 But NASA also plans an "evolved" 384-foot-tall (117 m) SLS version that can launch 143 tons (130,000 kg) and generate 20 percent more thrust than the Saturn V.
SLS and the Orion capsule, which is also in development, will help get astronauts to a near-Earth asteroid and Mars, NASA officials say. The first launch of SLS in 2018 will send an uncrewed Orion on a journey around the moon. The rocket and capsule should fly astronauts together for the first time in 2021 or so. The current plan calls for sending these crewmembers out to rendezvous with a near-Earth asteroid that a robotic probe has dragged into orbit around the moon.